Join us for an evening of great food and fun vibes at our progressive dinner youth event! An evening of fine artistic food and enjoyable company. 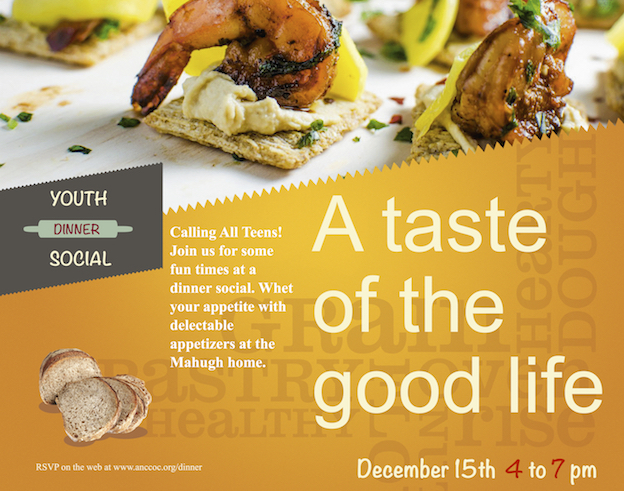 Satisfy your appetite with a three course meal specially crafted for today’s discerning teens. The evening starts out with appetizers served at the home of the Mahughs, followed by the main course at the Guyers. Top off the evening with delectable desserts at the Johnsons. Please RSVP below for an accurate head count. Transportation, if necessary, will be provided. Contact Kira or your youth leaders for more details.